The South African economic climate is not great right now, and according to this article published on News24 last year, it is at it’s lowest since the recession in 2008. There has been a constant rise in prices and the cost of living of the last few years with petrol becoming increasingly more expensive which raises food prices among other things. So there's no time like the present to learn how to save some money. Especially if you live in one of the more expensive cities. Here’s how a little D.I.Y will save you some C.A.S.H. While you’ll probably be tempted to call a professional to fix a blocked toilet or a leaky pipe, you can also save some dough and learn to do these things yourself. Most of these can be done with little to no experience, as long as you use common sense. But always make sure to research the problem (and possible solutions) thoroughly before attempting to fix them or you might actually cause more damage. Also - don't mess with electricity - it can have deadly consequences! Always switch electricity off at the mains, and call a professional if at all uncertain. Toilets can back up for many different reasons and there are various ways to deal with water threatening to overflow from your throne’s bowl. 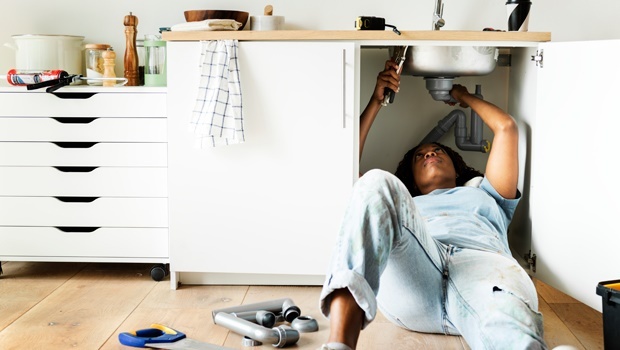 According to Laws Plumbing, you could be charged anywhere from R550 an hour or more for a plumber to come and see to your needs, and that's without a call out fee. If you’ve noticed a leak from the cupboard under the sink and you’re a bit worried, then you might need to give the nuts a tighten (stop giggling) or replace one of the washers. I advise you to leave electrical work to the professionals as it can be dangerous. But the exception is replacing a light switch. It’s easy and can be done with minimal hassle. Be sure to switch off your electricity before attempting this though. According to JEH Electrical, the average fee for an electrician to come out and look at your light switch would be a R500 excluding vat hourly rate which consists of a R365 call out fee and R135 for the first hour, everything after that is billed within 15 minutes increments, plus you'll be charged for the gear needed to do the job. Little cracks can appear in your walls from normal wear and tear over time or from nails, hooks or screws. But how do you fix these holes? It’s so much easier than you think. All you need is some spackling paste, a putty knife and some water. Here’s a video to show you how. The Home Doctors says their callout fee is R790 per hour and any parts or spares have to be paid for as well. Remember to always put your safety first and be careful especially when working with electricity or sharp tools.